Regulatory Status: Hawaii Injurious Wildlife (HAR 124). It is against Hawaii State law for any person to introduce, keep or breed any mongoose within the State except by permit from HDOA; permits are not issued for Kauai County or the island of Lanai. 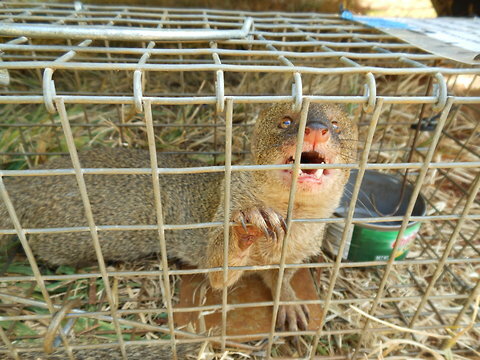 Fines for violations are between $250 and $1,000 for each mongoose introduced, kept or bred. HDOA Animal Industry Division Quarantine Rules HAR 142-92. Report this species if seen on Kauai or Lanai! Mongoose are a weasel-like animal totaling about 26″ in length with a long, brownish body, short legs and a tail as long as its body. They have small rounded ears and a pointed nose. The mongoose is active during the day and generally sleeps in dens at night. Mongoose are opportunistic feeders that will eat birds, small mammals, reptiles, insects, fruits, and plants. They prey on the eggs and hatchlings of native ground nesting birds and endangered sea turtles. The small Indian mongoose has been blamed with the extinction of ground-nesting birds in Jamaica and Fiji and commonly kill birds, including 8 federally listed endangered Hawaiian birds, such as the Hawaiian crow (‘alalā), petrels (ʻuʻau) and Hawaiian goose (nēnē). It was estimated in 1999 that mongoose cause $50 million in damages to Hawai`i and Puerto Rico annually. The mongooses found in Hawai’i are native to India and were originally introduced to Hawai’i Island in 1883 by the sugar industry to control rats in sugarcane fields on Maui, Moloka’i and O’ahu. The introduction of mongoose to Hawaii with the intent to control rats was misguided, because while rodents make up a large portion of the mongooses’ diet, the their substantial negative impact on other desirable birds, insects, and animals outweighs their minor impact on rat. Mongoose are now widespread on all of the main Hawaiian islands except for Lanaʻi and Kauaʻi, where there are no known populations. Mongooses can live in both wet and dry conditions including gardens, grasslands, and forests. 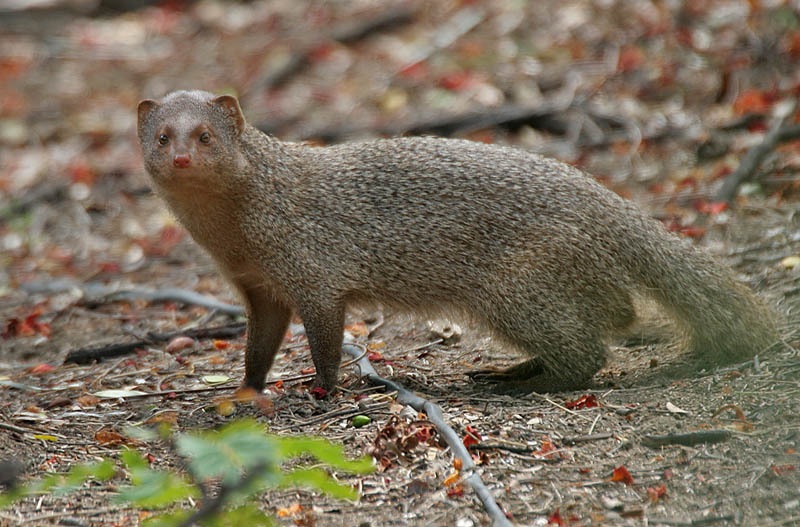 Are Mongoose an Example of Biological Control Gone Wrong? No. While the introduction of mongoose to Hawaii is often casually referred to as an example of biological control gone wrong, the introduction of this species by private individuals in the sugarcane industry was not part of any scientific biological control process. Biological control, or “biocontrol,” is a robust scientific field in which research is done to identify a predator or pest of a given invasive species from its home range, followed by extensive research to determine whether the predator or pest, if introduced to Hawaii as a biocontrol agent, would impact only the invasive species in question. Mongoose did not undergo this evaluation prior to entry and should not be considered an example of biocontrol. You can learn more about modern biocontrol efforts at the HDOA Plant Pest Control, Biological Control Section website. Cats, rats, and occasionally fleeing pheasants have been mistaken for mongooses. Cats have a rounder head, pointed ears, longer legs, a flat nose, and usually have a jumping pounce. Large rats run low to the ground, like mongooses, but are usually spotted at night (unlike mongooses). Pheasants also run with a low profile and since sighting them lasts only seconds, they can easily be mistaken.